Tammy Coulon and Leonora Wheeler tend to the spinach at Organic Family Farms. An aquaponic system uses nutrient-rich water from tanks filled with fish to replace soil in a system similar to a hydroponic system. 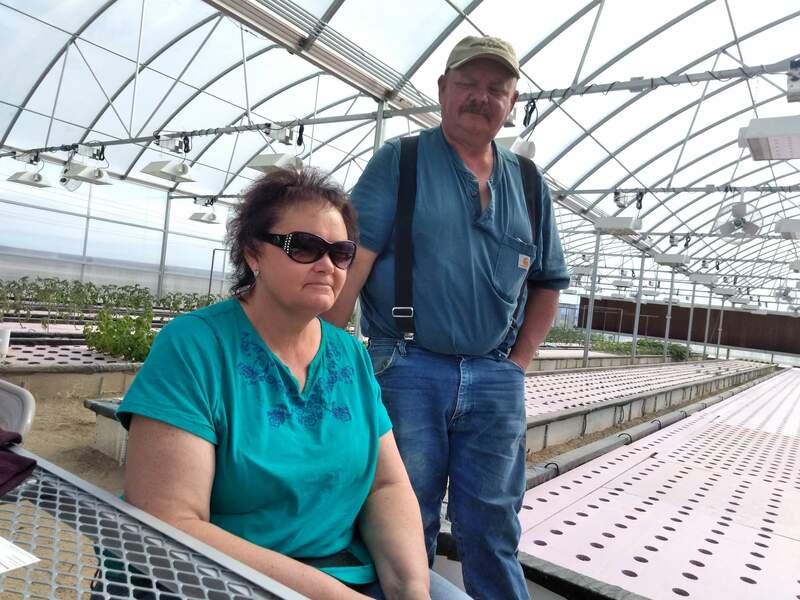 Jeff and Tammy Coulon have opened Organic Family Farms south of Cortez to market organic produce from their aquaponic greenhouses to restaurants in the Four Corners. 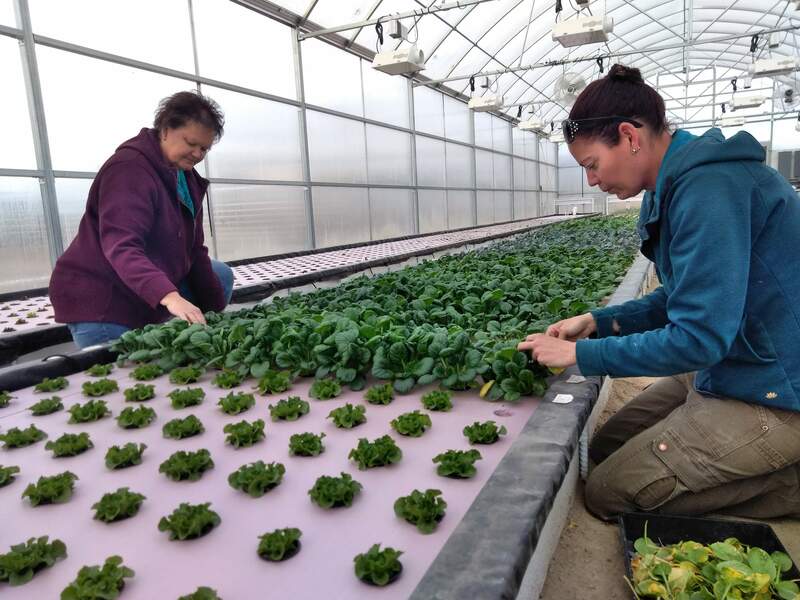 The Coulons have two 60-foot by 120-foot greenhouses where they are raising organic produce to market to restaurants in Durango, Cortez, Moab, Telluride and across the Four Corners. Jeff Coulon lifts a growing bed to reveal the nutrient-rich water that replaces soil in an aquaponic system. The Coulons’ Organic Family Farms is fueled by nutrient-rich water produced by 1,200 blue channel catfish. Jeff and Tammy Coulon started aquaponic farming as a test – just for produce for the family dinner table at their farm near Ainsworth, Nebraska. It proved so successful it turned out to be key to enabling their return to their childhood homes in Montezuma County. Based on the success of their small, family aquaponic system, they decided to open Organic Family Farms just south of Cortez. An aquaponic system uses organic nutrient-rich water coming from tanks filled with fish to replace soil in a growing system similar to a hydroponic system. 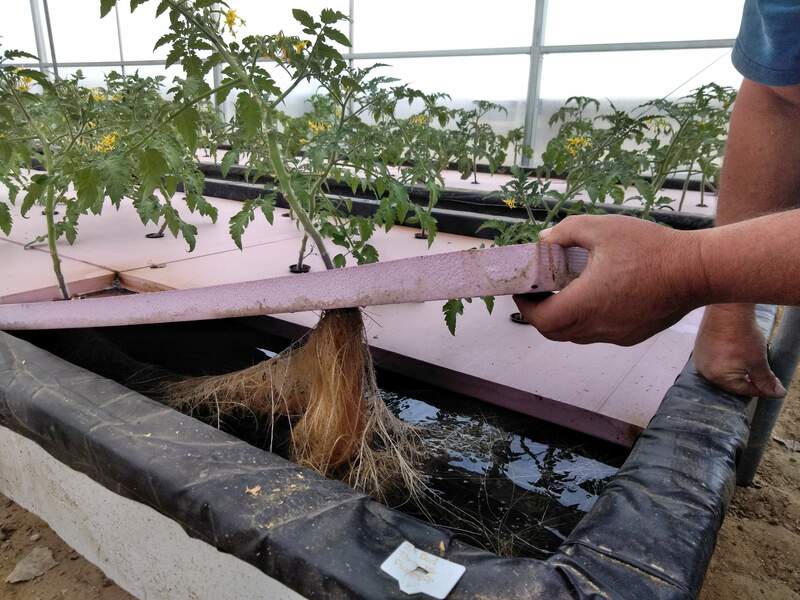 The advantage of aquaponics over hydroponics, Coulon said, is that an aquaponic system uses natural organic fertilizer from the fish manure, while most hydroponic systems use chemical fertilizers. 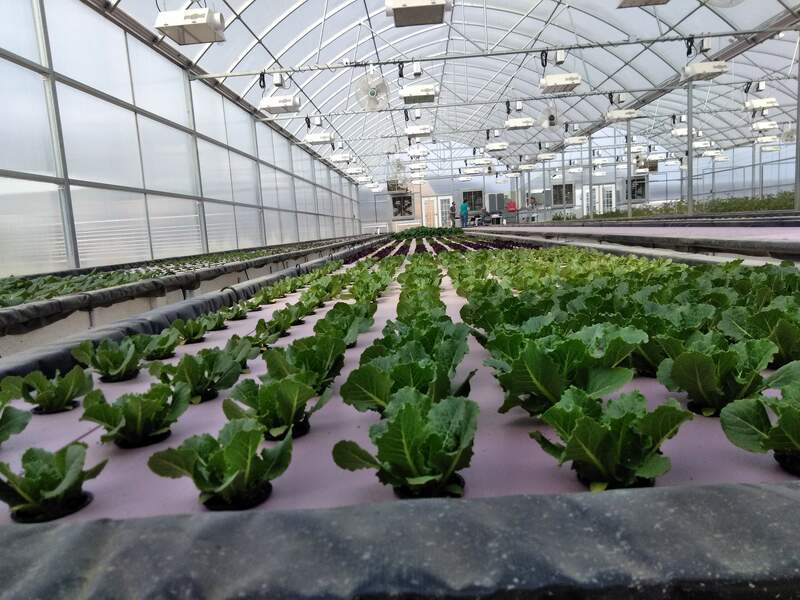 The farm has begun its inaugural season growing organic produce for individuals and for restaurants from Pagosa Springs to Moab. “Most of our family is here or the surrounding area, and we wanted to move back home. I graduated from Cortez and Tammy graduated from Dolores,” Jeff Coulon said. A limited market for organic produce in Nebraska and the appeal of returning home led to the opening of Organic Family Farm, located at 5200 Montezuma County Road 21. “We were just amazed at what we grew in Nebraska, the sweetest, best-tasting tomatoes I ever had, and we figured we could do this work out here,” he said. 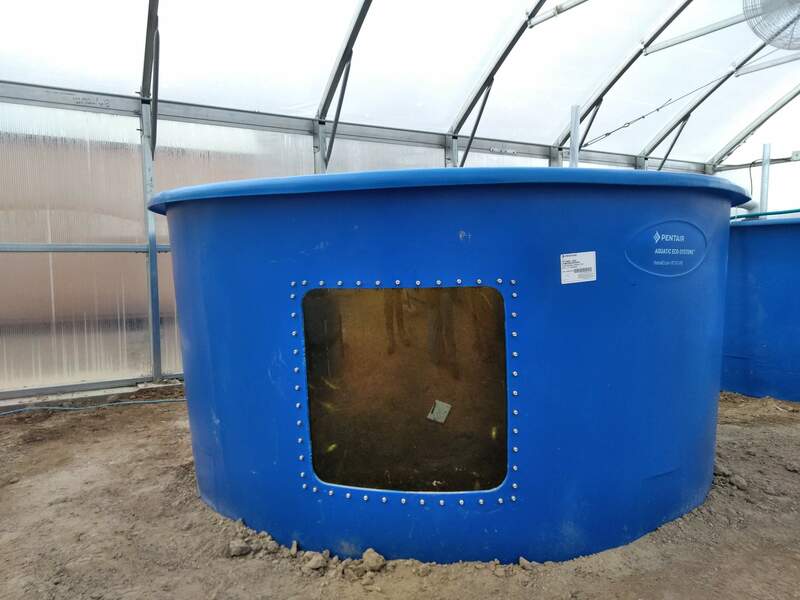 Some 1,200 blue channel catfish kept in several large tanks produce the nutrient-rich water to feed two 60-foot by 100-foot greenhouses filled with tomatoes, green beans, cucumbers, peppers, onions, basil spinach, lettuce, arugla, kale and other vegetables and greens. Rustin Newton, chef-owner of Mutu’s Italian Kitchen in Durango, said the availability of organic, locally grown produce has him interested in tomatoes, basil and other produce from Organic Family Farms. “They have the ability to produce year-round, and to produce earlier than we’ve been able to get local produce before,” he said. In their inaugural year, the Coulons are aiming to have their first crop of tomatoes in by May. Newton said it’s previously been late July or August before he’s been able to get his hands on a substantial amount of locally grown tomatoes. “We’d like to serve organic produce, and even better, we’re able to serve products that are local and keep the money in the local economy,” Newton said. Some 250,000 gallons of water are in Organic Family Farms’ aquaponic system, and Jeff Coulon said they add about 150 gallons of water to the system daily to replace water lost to the plants and to evaporation. In total, he said the closed-loop aquaponic system, which uses the plants to filter the fish-manure rich water so it can be cleansed, oxygenated and sent back to the fish tanks, uses only about 10 percent of the water that would be needed to irrigate a similar sized garden. Coulon said the closest commercial aquaponic system that he knows of is in Texas. He estimates it will take seven growing seasons to recoup his investment in the aquaponic system. The family began building their system in June and the first seeds were planted in February. “We got the fish for Valentine’s Day. It was our Valentine’s Day present,” Tammy Coulon said. The fledgling operation remains an all-family affair. The Coulons’ daughter, Lenora Wheeler, and her husband, Shawn Wheeler, are partners. Tammie Hutson, Jeff Coulon’s sister, handles the marketing and bookkeeping. Even the Wheelers’ son Dravon, 9, helps out after school.